There is something about a one-man-show that lets the absolute passion of the performer shine. This began with a passing remark about Tayo Aluko's similarity to Robeson, leading Tayo to write a show in 2007 which has been honed and performed since then. 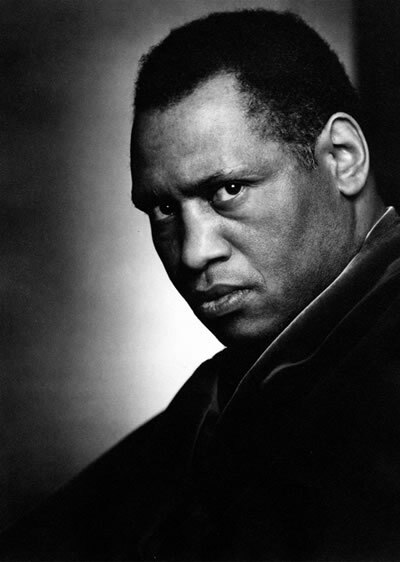 Robeson is a forgotten hero and through spoken word and song, through speeches, articles, facts and innuendo, Tayo Aluko embodies the incredible Paul Robeson like a beacon of light. Robeson, born in 1898 was a star athlete, the only black man in his college. He was a lawyer until he became famous, thanks to his ambitious wife and manager Essie, performing concerts, theatre then films worldwide. He was particularly popular in England where he toured extensively. Robeson was a juggernaut - as well as acting and singing he was a musicologist, learnt 25 languages and was highly politicised for his support of worker and black rights. His affinity with communists and trade unionists had him branded un-american and a Communist, with his passport revoked for 9 years. Still, he lived till he was 77 and even visited NZ in 1960. This is a wonderful show, highly recommended, entertaining and inspiring with brilliant accompaniment by pianist Julian Raphael and the incredible victorian venue 'The Moorings' adds a magnificent air to the story. Visit www.fringe.co.nz for performance details. On until 1 March 2015 in Wellington. Original generation time 1.2701 seconds.